In the middle of the Cold War, there was some debate regarding the main tank weapon of the future, largely focused on conventional kinetic energy rounds (cannon shell) versus missiles. In 1966, in an effort to utilize both capabilities, General Dynamics Land Systems designed a new low profile turret, equipped with a 152mm Gun/Missile Launch system that could fire conventional HEAT (High-Explosive Anti-Tank) and HE (High-Explosive) rounds, or launch ATGMs (Anti-Tank Guided-Missiles). The new turret was mated to a Medium Tank M60 Patton hull, creating the M60A2, unofficially nicknamed the “Starship”. Though the vehicle was one the most technologically complex of its era, this also contributed to its failure, largely due to difficulties with maintenance, training, and complicated operation. 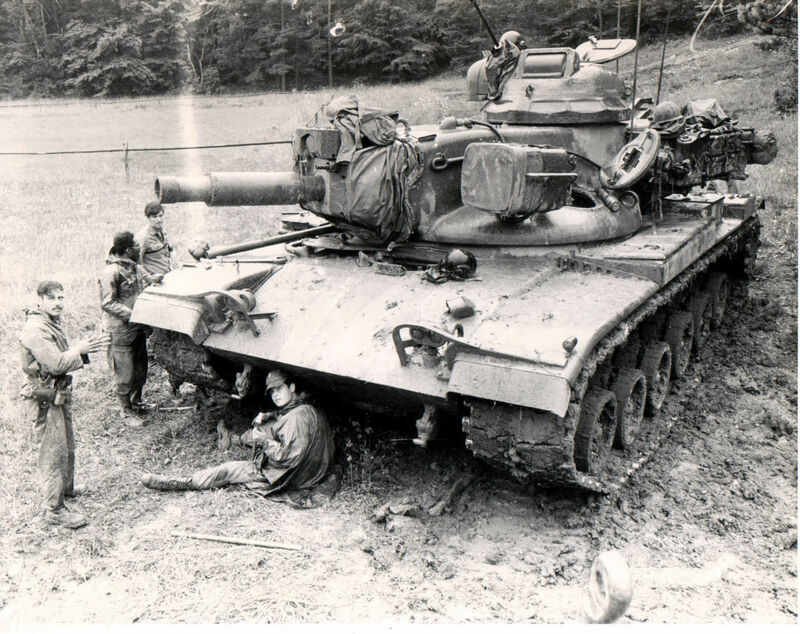 The M60A2 was designed as a stop-gap vehicle until the joint US-German MBT-70 project was ready for service. This project was intended to provide both the United States and German militaries with one Main Battle Tank. It would use the same Gun/Launcher weapon as the A2 and later in the M551 Sheridan. The United States ordered the M60A2 in 1971, however, production did not start until 1973, and continued through 1975, at the Chrysler Tank Plant in Warren, Michigan. Initial plans called to replace the turret of every M60 with the new A2 turret, but only 526 vehicles were produced (according to official US Army documentation). 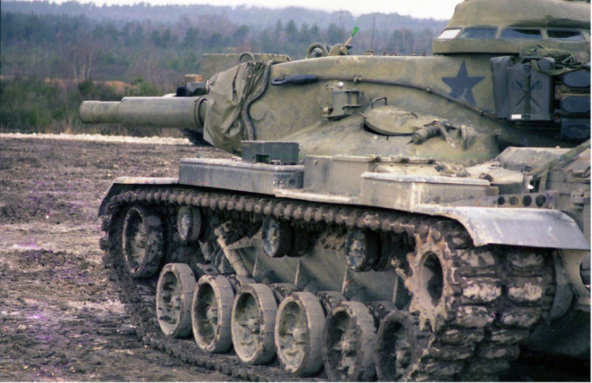 Aside from the turret and weaponry changes, the tank was nearly identical to the regular M60. It featured the same 4.29 in (109 mm) glacis armor, torsion bar suspension, and the 750hp Continental AVDS-1790-2 V12, air-cooled twin-turbo diesel engine which would propel the vehicle to approximately 30 mph (48 km/h). The M60A2 featured a unique Gun/Launcher mounted in a new, low profile “space age” turret. It consisted of a large disk with a narrow channel in the center. Each crew member in the turret had their own hatch, a rare feature in tanks. As a result, each crew member was effectively isolated from one another with the gunner and loader separated by Shillelagh missiles in their storage position. The commander was isolated in the rear compartment under a large rotating machine gun equipped cupola, which somewhat negated the low profile silhouette of the turret. There was a mounting point to the left of the gun for a Xenon White-Light or Infrared Spotlight for night time operations. A large basket for storage was added to the rear of the turret and also included banks of smoke-grenade launchers, one bank of four on each side of the turret. The main feature of the A2 turret, is its main armament, the M162 Rifled 152 mm Gun/Launcher, a weapon similar to the M81E1 found on the M551 Sheridan Light Tank. As mentioned previously, it was capable of firing both HEAT (High-Explosive Anti-Tank) and HE (High-Explosive) rounds or launch the MGM-51 Shillelagh ATGMs (Anti-Tank Guided-Missiles). Load-out for the main armament was 33 conventional rounds and 13 missiles. The conventional rounds had a range of 1.5km (1640 yds). The HE was a more than capable anti-infantry weapon, while the HEAT ideal for close range anti-armor engagements. For a longer range anti-armor capability, the ATGM was to be utilized. The Shillelagh ATGM guided system. After acquiring a target a small charge would launch the missile out of the barrel. Once clear, four rear stabilizing fins would deploy followed by ignition of the engine. The missile was guided to the target via IF (Infrared) beam. As long as the gunner kept the target in his scope, the missile would strike accurately. This system, however, contributed to one of the tank’s major issues. The M162 Gun/Launcher experienced frequent faulty breeches. Often, not closing correctly, allowing the exhaust of the launching Shillelagh to vent hot noxious gasses into the crew compartment. The Gun/Launcher was fully stabilized. This meant that while moving over rough terrain the gun would stay relatively level and the gunner able to keep a target in his sight. This did not apply to the use of the ATGM however, which could not be fired on the move. In early testing, the system was plagued with misfires and premature detonations of the conventional case ammunition, caused by unburnt propellant in the bore and breech. This was often catastrophic as it set off the projectile in the barrel as it was fired. To combat this, early versions of the gun were equipped with a traditional fume extractor on the barrel. Later versions would use the Closed Bore Scavenger system, a compressed air system that pushed the fumes and gasses out of the muzzle when the breech is opened. Secondary armament consisted of an M85 .50 Cal. machine gun in the commander’s rotating cupola, and a coaxial M73 7.62mm machine gun. Neither weapon was especially liked by the crews and later replaced. For the commander’s cupola, the traditional .50 Cal. (12.7mm) M2HB “Ma Deuce” was installed, and the coaxial replaced by the M240, a license-built copy of the Belgian FN Mag. Loadout for the MGs was 5, 560 rounds of 7.62 mm and 1, 080 rounds of .50 Cal. (12.7mm). One of the A2’s more hi-tech features was its laser range finder and the M60A2 was the first tank to be equipped with one. This worked well in daylight but less so in darkness, effective to 600 meters in 25% moonlight. A special filter was added to the exterior searchlight to alleviate this issue. Early model M60A2, US Army 3rd Armoured Division. Note the fume extractor on the barrel. Later model M60A2 in MERDC (Mobility Equipment Research and Development Center) camo scheme. Note the barrel is without fume extractor. In total, around 520 M60A2s were built, with service in the US Army and the US Marine Corps. A study by the US Army, proposed the M60A2 operate in an “overwatch” role, in support of more traditionally armed tanks, and provide long-range anti-tank support capability from the rear. The A2 had a short service life succumbing to the same failings of Sheridan, concerning the missile system. The designers of the missile, Ford Aeronutronic, a division of the Ford Motor Company, greatly underestimated the task of producing a fully operational Anti-Tank Guided Missile as advanced as the MGM-51. Development of the Shillelagh was awash with technical and mechanical issues, including problems with the propellant, ignition of the propellant, tracking system and the infrared command link responsible for missile guidance. Despite its many problems, the A2 did succeed in enabling “carry-over” technology for the MBT-70 project and the later M1 Abrams Main Battle Tank. The A2 was fully removed from service by 1981. Many of the A2s had their turrets removed and replaced by M60A3 turrets. In 1985 some M60A2s were converted into engineering vehicles such as the M60A1 AVLB bridge layers or the remotely controlled Panther mine clearing vehicle. The M60A2 is frequently referred to as the “Starship”. However, there is no official use of the name in any documentation, at least dated to when the vehicle was in service. It may well be a post-service name. It is widely believed that it bears this name due to either its highly sophisticated technology (for its time) or the non-traditional appearance of its turret. 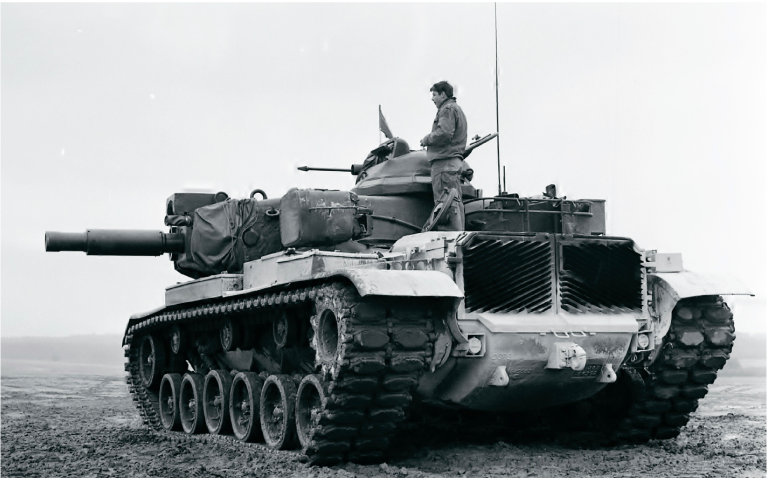 Armor Magazine, January-February 1972: The Death of the Tank by Lt.Col. Warren W. Lennon. Where did you get your info on the M60A2? I crew the M60A2 from 77 to 79 1/37 Armor Katterbach Germany, I see some wrong info that was posted, we never had the M37 coaxial machine gun, we had the M219 coaxial machine gun, later it was replace with the M240 coaxial machine gun, The TC had the M85 machine gun, never had the ma-deuce, M2 machine gun on the M60A2, there’s no way it could be mounted in the TC cupola. As for the crew members being isolated from one another? The only person actually isolated is the driver who’s in the hull, as a loader and the TC were not isolated, now as for the Gunner, the missile rack was the only thing that isolated him from us, but in an emergency I can pull two pins and move the missile rack out of the way. 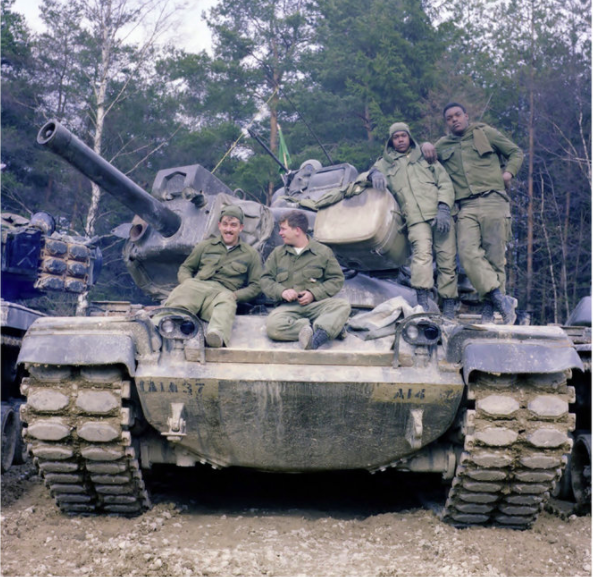 The 1/37 Armor battalion in Europe, was the only battalion that qualified all 54 tanks in tank gunnery! We are very glad to hear from you. All of our sources are mentioned at the bottom of the article. Also, the writer and one of our editors will be having a look at the information you have sent us. We are also trying to get our hands on the TM of the M60A2. Talk to Sabot Publications, they got almost all the info and photos from the guys from the 1/37 Armor, as for a TM, I think there one or two guys in our Facebook group said they have there TM manual. I sent a message to SABOT publications. If you could also direct me to your Facebook group and those guys with the TM, it would be awesome! Ok I’ll try, I don’t have the authority to bring you in to our Facebook pages that will be up to the ministration that you will have to talk to. Here a fact about the M85 machine gun on the M60A2, they were mounted upside down, there was no room to open the feed cover from the top that way. As I have said before, we never had the M37 coaxial machine, we had the M219 coaxial machine gun, we were lucky to fired two or 3 rounds before they jammed, the M240 was a dream it could rock and roll all day with no problems. Actually the M60A2 tank, lead the way to the technology we have today’s modern tanks. Perhaps Sabot publication, will give you the info from the people who help them with info and photos, they came out with two books on the M60A2 with lots of info and photos! A2’s came with M73 coax and later upgraded to M219. I was on A2’s from 73 to 78 at Ft Hood and Katterbach. I personally loved them ! I had better luck with the 7.62 if we just used graffite and fired it dry on the other hand some people said soaked it wit oil. I also was on a M60A2 from 1976 to 1979, 1/67th Armor BN, 3rd Tiger BDE Fort Hood Tx. we were the only A2 tank BN in the US at the time. we had at first the M37 then switch to the M219 coaxial machine gun. the M85 machine gun with its low and high rate of fire was great. 1/67th Armor US. qualified all of its tanks as well the three years I was there. I will have to go see if I have the manual. I also agree with Dennis and Eric I was also in Co. B. 1/37 from April 79 to June 81 when the batt. Trans to M60A3. Was good times and the batt. always qualified all crews and tanks. We never really had any bad problems in keeping up. We never had heard the tank called “starship”. Not even when I was stationed @ 1/67 in 1st A.D. In Texas in 77-79. I was a gunner on the A2 for 4 yrs at fort hood Tx from 1975 thru 79 Co. 1/67At 2nd A.D. the tank had its faults but when the system was working it was quite deadly. We were the first unit to get the A2 and ran A lot of test on the missiles where they were stored had A lot to do with malfunction s . I have fired the missile in the stab mode just to prove to a Tec rep from Detroit that it could be done. I also flew one into.a small group of trees and picked it up on the other side and hit the target. The passive night system was clear and quite reliable you could see the laser range finder blip of of the target and watch the tracer draw a line to the target. We never had. M2 50cal in the tank because the M85 mounted upside down. I think it was in 77 we got the new rise engines they where 850 or 950 horsepower can’t remember for sure. I shot a 2X4 one night on the zero range as a bet to 1SGT for a case of bud and won. Like i said if you could keep the system working it was quite accurate. I meant “AOAC” but phone didn’t agree. I fired missile during a fire power demonstration for President Carter at fort hood at 1200 meters and the bird was hot. The Army wanted to do it at 1000 meters but I told them that left little time to correct because you didn’t have control till missile came back up in to tracker beam around 800 meters. The M60A2 was never issued to the Marines. It was tested in landing craft. My unit drew the tank in 1975 (A/1-32 AR). Had the M73 coax and M85 50cal, mounted upside down as noted. The M219 coax replaced the M73 soon after we drew the tanks. The M2 50cal WOULD NOT FIT, so it was never used. Third Armored Div had two battalions organized under H series TOE – 5-tank platoons @ 3 plts per company, 2 in company HQ, plus 3 in bn HQ tank section, 3 companies, plus a HQ company and a combat support company. Don’t think the tanks were issued to units without the closed breech scavenger system. Thank you for the information. Edits shall be made. This whole website is great. I was in the FIRST class of AIT M60A2 crewmen in Ft. Knox, Ky. in January 1974. We were then sent to units in Germany and arrived before our A2’s even got there. I was stationed with the 3rd Armored Division, 3rd Battalion, 33rd Armored Regiment, in Kirch Goens, Germany. We received them in Summer of 1975. Spent many cold nights in Graf and Hohenfels. Sorry, I meant 1-5 May receiving M60A2. C-1-1, Ft Knox, November, 73 to February 74. I was in HQ Company HQ tank section 1/37th Armor 75-78 with a short stint in B Company. I loved that tank more than the A-1, no round canister flying back into the turret. I do remember lots of mechanical problems. The heaters were a pain and the blower motors burned through brushes like crazy. An old track mechanic taught me a trick of using the carbon rods in D batteries until we could get some more. Many great times. PCS to Riley in late 1978 and they had no M60 A2’s. I drove down to Knox and tried to get reassigned to a Cav unit that had them but the Army said no. What a waste of training!